About 2.5 acre. In the beginning the school was started up to eight standards. The noble idea behind the establishment of this school was impart quality education to the children of poorer sections of the society. Since then the school has progressed by leafs and bounds. 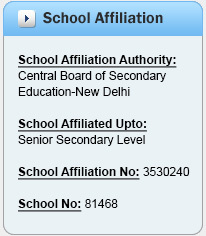 Now the school is affiliated up to class XII. The school is imparting quality education at low cost to the students not only from the surrounding areas but for the S.G.R.R public school vikas nagar was established by late mahant shri indresh charan das ji in 1993. The school is situated in lush green surrounding of udiyabagh tea estate. The school is spread over an area of students of Jaunsar and Himachal Pradesh. At senior secondary level classes are running in science and commerce stream. The school has well equipped labs, sports room, library etc. the teaching staff is well qualified and trained. Many ex students of the school have excelled themselves in the different walks of life. Many of our students have been working successfully in army, navy, air force, bank, and in the police department. Many of them have made successful carrier in the field of medical, law and science. The school has so far proved to be really a boon to the students of this area.